So you can’t run the Server. Some time it’s giving “Exception in module wampmanager.exe at 000F15A0” error also. The solution is very simple. The following C++ runtime dll is required to run executables compiled with Microsoft Visual C++ 2008. It is required to run the wampmanager.exe program ( the icon that sits in your system tray ) and also some older versions of Apache server. So just execute anyone suitable .exe file. This entry was posted in Wamp. Bad english. Can’t follow anything. Which .exe files you mean? Thanks for your visit and comment. Ya, it’s bad English only. I’ll correct myself. Just see one more time, I corrected your problem. 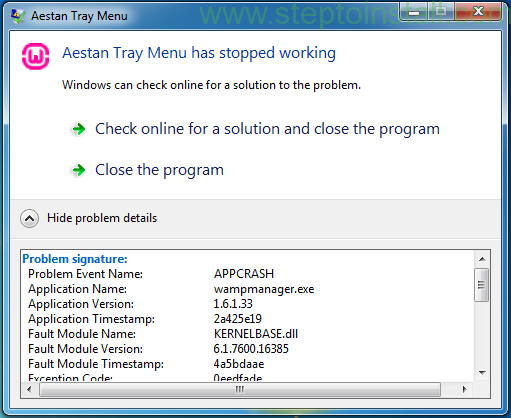 The wampmanager.exe i.e ‘Aestan Tray’ is a 32 bit exe regardless of wether you install the 32bit or 64bit version of WAMPServer. So even if you have installed the 64bit WAMPserver on a 64bit Windows you still need the Microsoft Visual C++ 2008 SP1 Redistributable Package (x86) runtime installed. Solution is very simple. Following file is one part of Microsoft Visual C++. It’s allow to run Apache server. The solution is very simple. The following C++ runtime dll is required to run executables compiled with Microsoft Visual C++ 2008. It is required to run the wampmanager.exe program ( the icon that sits in your system tray ) and also some older versions of Apache. sir i have installed the wamp software but it was giving the the error as aestan tray menu has stopped working,then i installed Microsoft Visual C++ 2008 SP1 Redistributable Package (x86) according 2 ur instructions given on net but still its not working .plz tell me the solution wt 2 do.